We will help you to increase your sales, make it easier to spread information and entertain your customers. With Craneworks’ digital solutions it is easy to add value to your products and services. Our solutions also help to guide your customers closer to services and products. Digital marketing solutions and location based customer guidance helps our clients to improve their business. Our comprehensive services and turnkey solutions guarantee the best return of investment. 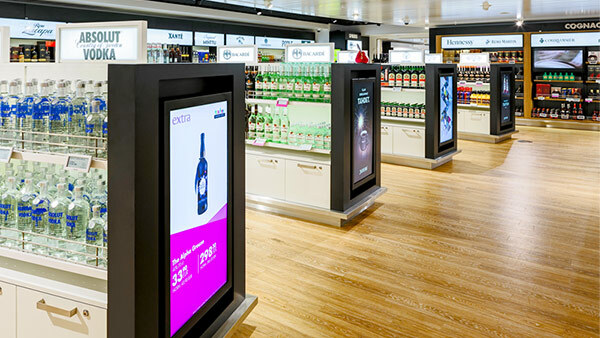 Our advanced Digital Signage, Dynamic Wayfinding and Augmented Media solutions are best ones in the market. We offer our Digital BCN-solutions as SaaS. The whole service is provided from Cloud with remote control monitoring, maintenance and updates. We also provide professional content production services, AV-material design and production. Our solutions together with trusted DOOH media marketing partners ensure increasing in sales and payback in media sales. Advanced platform for managing and publishing video, still and dynamic content. It is ideal for creating efficient advertisement network and blaze stunning contents. Digital Out Of Home (DOOH) aka digital outdoor advertisement is everywhere. 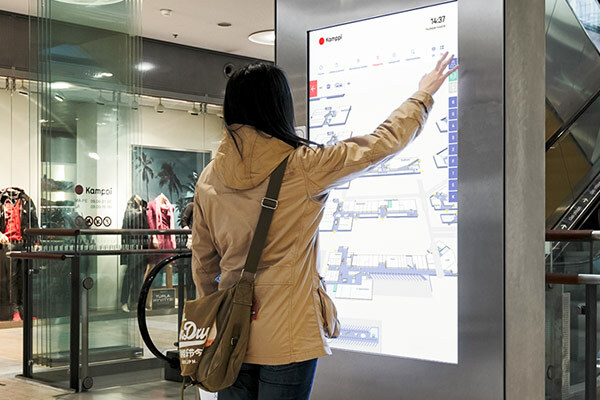 Interactive and dynamic guidance solution for shopping malls and public places. Dynamic Wayfinding brings customers closer to services and products. Programmable special campaigns, dynamic content, games, voting, happenings and beneficence campaigns. You name it and we’ll do it! Content is the King and we help you to design and publish stunning contents. We produce videos, graphics, tailored templates and also edit, speak, animate and programme content. Tailor-made for you and your digital brand. We have more than 25 years of experience in content production, so feel free to use us. For more than 14 years in the business, Craneworks is the leader in Finnish market. Thousands of productions, implementations and deliveries have built a forerunners expertise for us in Digital Signage. Our clients expect quality, creativity, comprehensive expertise in services and certainty of deliveries. Our knowledge in this field has brough us experience and confidence, therefore you can trust on our deliveries and implementations. Development in the technology motivates us. We are continuously developing our products and services with the whole company. Customer needs, user centeredness and ease of use are our starting point. With us you are one step ahead of others. Black screen or bluescreen does not sell or increase the value of your brand. Through the years we have invested in the reliability of our systems. You can use our products 24/7/365. On cruises people are already on a positive purchasing mood, and with digitization we have been able to boost our marketing, which is also reflected in our sales figures. For years I worked with Craneworks in shopping center Kamppi. It was a pleasant thing to do with a partner, who closely follows the development of the industry and is able to recommend us the best solutions. 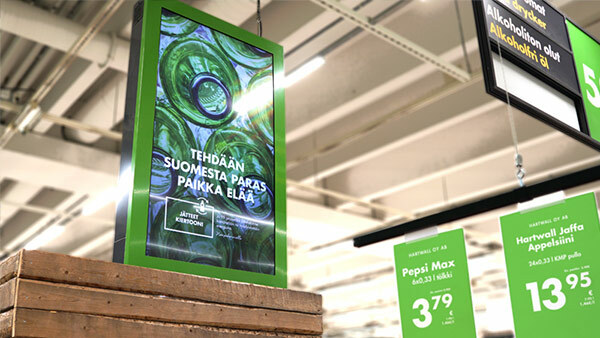 Recommendations have always been right and thanks to their quality and functionality, they have brought good income for Kamppi Shopping Center through the years. Finlands' best Information Display System. We help our clients from the beginning to the end of the project and from there onwards. Before the screens, infokiosks and LED walls are in place, many of our professionals have been used in the process for things to seamlessly click in the right place. Even after installation, the system needs maintenance and technical support - not forgetting the most important thing: stunning content. We know the industry from 14 years of experience. You can contact our experts even before you start planning your project. We will consult you in technical, service-oriented and commercial affairs. Competent project management is a prerequisite for success in delivery. We will plan your implementation with the experience of thousand projects. Our "in house" software developed for DOOH media and guiding services is constantly evolving. Our programming team can execute special solutions for your needs. Latest displays, infotools, LED screens, infocenters, transparent, hologram or autostereoscopic displays, you name it! We will find suitable products for all your needs or we can build it ourselves. Do not let your message get lost in the image stream. Catch your clients attention. We provide you with expressive campaigns and creative templates for your brand. We do tailor-made solutions for all kinds of special campaigns with maximum visibility and attention in the public environment. Design also means designing hardware and devices. We can customize the solution that suits you best. We design, install and maintain the systems we supply. This is how responsibility won't be shared with various deliverers and we will make sure everything works how it needs. You are not alone! Our Helpdesk will serve you on weekdays from 9am to 5pm in all kinds of situations. 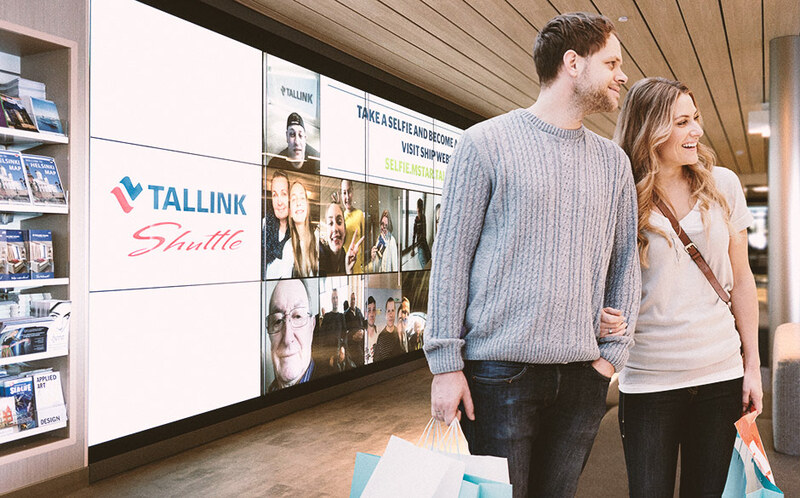 Tallink Megastar sails on the Baltic Sea and is by its Digital Signage perhaps the worlds' most modern and comprehensive cruise ship. There is a total of more than 200 DS-surfaces that Craneworks has designed and implemented on the ship. On board, the DS packages are housed in a variety of lobby areas, lounges, shops, restaurants and car decks. 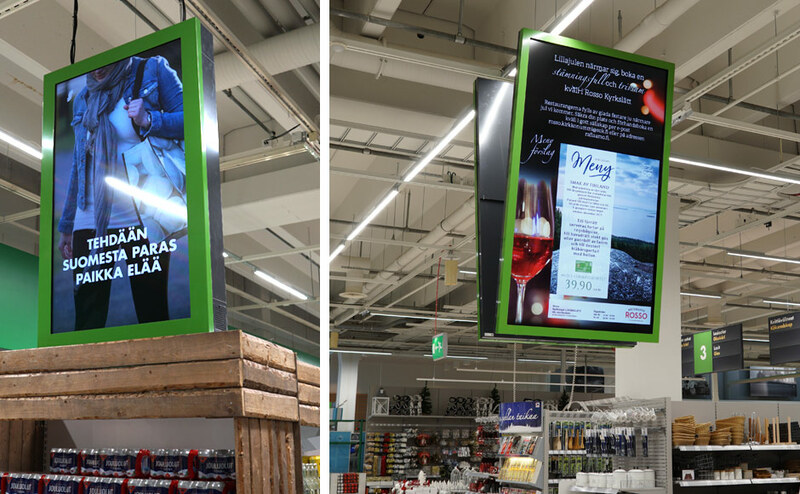 We were honored to join the S-Group's national digitalization project by delivering the best DOOH platform for the S-Group's chains and Regional Cooperatives. We assist them in the concept design, engineering and implementation of the S-Group's outlets and sales network for Digital Signage projects. We design together with SOK Media network display solutions and map all locations. Our mission is to ensure digital advertising reaching eyes in the right places. Contact and book a personal presentation and see the latest technical innovations in our new showroom in Espoo. Let's make an ideal solution for you!